Wolfenstein: The New Order is a video game developed by Machine Games and released in 2014. It’s a first person shooter set in an alternate history where Nazi Germany won World War II. It’s 1946. B.J. Blazkowicz is part of the Allies’ last great armada seeking to destroy the base of the Nazi scientist Wilhelm “Deathshead” Strasse. Blazkowicz and his team fight their way into Strasse’s castle hoping to kill him and end the war, but they are trapped, and Strasse forces Blazkowicz to consign one of his comrades to death. Blazkowicz then escapes, but as he does so is shot in the head and enters a vegetative state. Fourteen years later, the Nazis have conquered the entire world, including the United States, which surrendered after the Nazis nuked New York. Blazkowicz recovers full consciousness to find the Nazis are shutting down the hospital he has been held in and murdering all the patients. Galvanised by his nurse, Anya Oliwa, he kills the Nazis and escapes. Anya drives Blazkowicz to her family farm. At the farm, Blazkowicz discovers a Nazi hiding in the boot of the car who reveals that the few remaining resistance fighters are held in a prison in Berlin. Anya’s family take Blazkowicz to the station so they can get the train to Berlin. 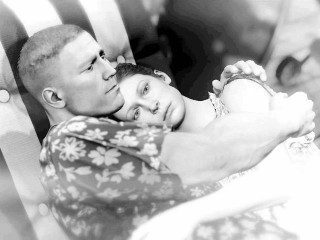 On the train Blazkowicz and Anya become lovers. Blazkowicz successfully breaks the prisoners out, although all but one are killed during the escape. The survivor takes Blazkowicz to a secret base in the centre of Berlin. There he meets an old comrade, Caroline Becker, leader of the ‘Kreisau Circle’ resistance organisation. Caroline has discovered that the Nazis are testing a new stealth helicopter in London and asks Blazkowicz to steal it. In London, the Kreisau Circle detonate a car bomb at the Nazi air/space port. In the confusion, Blazkowicz steals secret documents, infiltrates the rooftop hangar and opens the doors, allowing resistance members to hang-glide in and steal the helicopters. Back in Berlin, the stolen documents reveal the Nazis are reverse-engineering ancient technology hidden for centuries by a group called the Da’at Yichud. Anya discovers the uber-concrete the Nazis are using is deteriorating and suspects a Da’at Yichud scientist, Set Roth, has sabotaged it. Blazkowicz infiltrates the factory in Croatia that produces the concrete and rescues Roth. Roth tells the resistance about another cache of super-weapons that would be useful in the fight against the Nazis. The problem is it’s underwater. So, Blazkowicz hides in a weapons shipment being delivered to a Nazi nuclear submarine, and once at sea, kills the crew, takes control and retrieves the weapons from their undersea hiding place. Caroline discovers that keys that would enable the group to fire the nuclear weapons from the submarine are held on a base on the moon. Blazkowicz steals the credentials of a Nazi scientist after derailing a train on the bridge between Gibraltar and Morocco. Using the credentials he travels to London and takes a shuttle to the Nazi moon base, where he steals the keys and a shuttle to fly himself back to Earth. Wolfenstein: The New Order – has a ‘mission’ plot (see Spy Novel Plots). The original Castle Wolfenstein (1981) and Wolfenstein 3D (1992) effectively have no story. The hero simply navigates a maze shooting everything he comes across. Return to Castle Wolfenstein (2001) has a limited story. The player has a goal, to investigate and prevent the activities of the “SS Paranormal Division”. It features the debut of Wilhelm “Deathshead” Strasse, the antagonist of the subsequent games. Wolfenstein (2009) has a story too, but it is still very much a series of levels. Wolfenstein: The New Order in contrast, despite being a first person shooter, has a strong, if pulpish, storyline. The characters are far more realistic than previously. Though Blazkowicz himself is still largely indestructible, he is humanised, and the relationships and the dialogue are believable. The voice acting is first-rate and the facial animations have reached a level where nuance is a possibility. Unlike dialogue-choice games like Mass Effect, the story in Wolfenstein: The New Order is told mostly through quite lengthy cinematic cutscenes. This is similar to Max Payne 3, which also has a good story and great art direction, but where the player has limited ‘agency’ within the confines of the game. 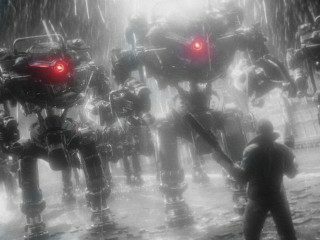 Unlike Mass Effect, in Wolfenstein: The New Order there are no branching storylines or open worlds and very few choices for the player to make. There is one exception – early in Wolfenstein: The New Order the player is forced to choose which of two non-player characters survive in an impossible to avoid, no-win scenario (if the player refuses to choose, both characters are killed and the scene restarts). The two characters are a hard-bitten Glaswegian paratrooper, Fergus, and an enthusiastic, young American soldier, Wyatt. The game then alters slightly depending on which non-player character the player chose to live. Wyatt gives the player lock-picking skills and armour upgrades, and Fergus gives him hot-wire ability and extra health, which enable access to different hidden areas. The surviving non-player character also appears later in the game but, a few cut-scenes and bits of dialogue apart, it makes little difference to the plot. In storytelling terms, the ending of Wolfenstein: The New Order is a little weak. The final ‘boss battles’ are tough and a good finale, but the last cut-scene is a bit brief and doesn’t resolve the storyline in a satisfying way. The end really is the place for an extended cut-scene that delivers an emotional punch. It was disappointing, as I’d been really enjoying the story up to that point. In much of Wolfenstein: The New Order going in guns blazing is the only option. In some sections though, the player can try to kill a commander by sneaking up on them and killing them silently. If they succeed then the rest of the level is easy, but if they’re spotted an alarm sounds and troops flood in. This makes for an interesting change of pace. Personally I’d rather have had more stealth sections. The developers claim the Wolfenstein games all take place in a the same alternate history. However, the stories don’t fit together, and the early games barely have a story anyway. The later games do include a coherent, if extremely unlikely, history. 1940 Nazis discover a source of occult power. 1943 Events of Return to Castle Wolfenstein. First Nazi attempt to use occult powers is prevented. 1945 Red Army retreats from Moscow after the city is obliterated. Royal Air Force is crippled in the Battle of Liverpool. Events of Wolfenstein. Occult breach is sealed. Nazis discover cache of advanced technology. 1946 Allied forces fail to destroy Strasse’s base. Blazkowicz enters vegetative state. US Navy defeated by combined Germany-Japanese force at Leyte Gulf. Soviet Union surrenders to Germany. 1947 Germany invades Canada. Red Army ceases organised resistance. 1948 Chinese Army repels Japanese. United Kingdom, China, Japan all surrender to Germany. USA surrenders after New York is attacked by a German atom bomb. 1949 German forces occupy the USA and demolish Mount Rushmore. Germany invades Italy. 1951 German astronauts land on the Moon. British resistance to German rule ends. 1956 German lunar base is completed. 1957 Gibraltar bridge opens to traffic. Enjoyable action and stealth gameplay, a good story and great art direction. The best game I’ve played this year. Wolfenstein: The New Order – is available for Windows, Xbox and Playstation on US Amazon here and UK Amazon here . If you enjoyed Wolfenstein: The New Order, you’ll love my novel A Kill in the Morning, which is also a spy thriller set in a ‘Nazi Victory’ alternate history. In the UK I recommend A Kill in the Morning on Amazon UK, although the novel is also available in bookshops. If you’d like to discuss anything in my review of Wolfenstein: The New Order, please email me. Otherwise, please feel free to share it using the buttons below.